It is with great sadness that the Kamihata Fish Group with its subsidiary companies announce that our Chairman Emeritus, Mr. Shigezo Kamihata, passed away on December 25, 2017 at the age of 91. Driven by his passion for fostering a human connection with nature, Mr. Kamihata led the Kamihata Fish Group of companies to dynamic growth and success, providing aquatic pet lovers around the world with access to premium-quality, innovative products. The Kamihata Fish Group encompasses Kamihata Fish Industries Ltd. (including Yamasaki Koi Farm and the numerous breeding operations under its umbrella), Kyorin Co., Ltd., Kyorin Food Industries, Ltd., including the Hikari® brand of products, and the Hikari Aquatic Laboratory. Mr. Kamihata’s legacy spans several decades, starting when he founded Kamihata Fish Industries Ltd. in 1961 and began growing Nishikigoi, the vibrantly colored carp that add a mesmerizing element to Koi ponds. 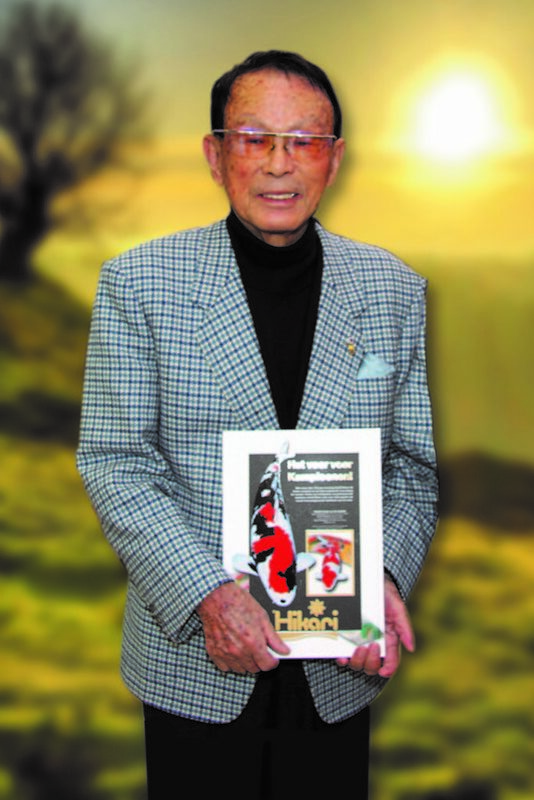 One of his most proud moments as in 1964 when a Nishikigoi bred by Kamihata Fish Industries Ltd. earned a championship prize at the All Japan Nishikigoi Contest, ushering in a new standard in the industry. As Kamihata Fish Industries Ltd. experienced explosive growth in subsequent years, it was divided into subsidiary companies: Kyorin Co., Ltd. was established as the fish food wholesale division in 1968; Kyorin Food Industries, Ltd. became the fish food production division of Kyorin Co., Ltd. in 1979. Under Mr. Kamihata’s leadership, the companies maintained their reputation for excellence over the years by continuously investing in research and development and building state-of-the-art facilities, such as the Hikari Aquatic Laboratory and the Fukusaki production facility. With a passion for nature and a thirst for adventure, Mr. Kamihata was a trailblazer in his commitment to using unspoiled natural environments as inspiration for his companies’ products. Through an effort known as the Kamihata Exploration Party, Mr. Kamihata and several of his employees — along with world-renowned researchers — would venture into the wilderness of South America, Africa and Southeast Asia to perform hands-on field research. By exploring undeveloped regions where tropical fish thrive, Mr. Kamihata and his team gleaned invaluable information about little-known species of fish and their ecosystems. The Kamihata Exploration Party’s findings have been published in leading industry magazines, including Tropical Fish Hobbyist, Aqua Life and Fish Magazine. In addition, Mr. Kamihata detailed his team’s adventures in his book, Kamihata in Search of Tropical Fish. As Kamihata Fish Group continues to enhance the lifestyles of aquatic pet owners around the world, the countless employees inspired by Mr. Kamihata will honor his legacy and ensure that his enthusiasm for the natural world — and specifically, tropical fish — will remain a core element of the company’s culture. To learn more, visit http://www.kamihata.com/en/index.html. Goldfish on Wheels - What's Your Best One-Liner?